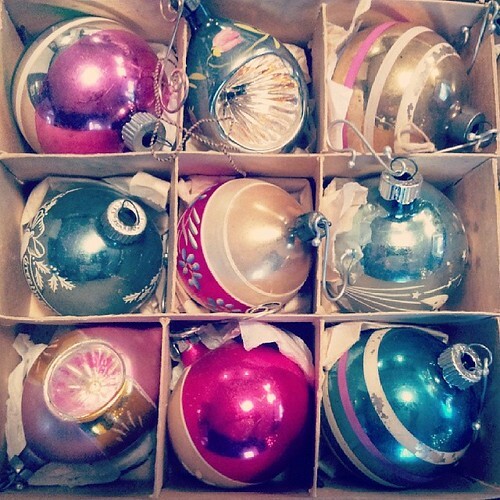 Vintage Ornaments, a photo by Gigi Thibodeau on Flickr. There's only two weeks now until Christmas. I go through phases of being all excited about it but then I have moments where I'm all stressed out and not feeling very festive at all. I think I am just really tired to be honest. It's been such a busy few months and more than Christmas Day I am looking forward to the school holidays. It'll be so nice not having to rush in the mornings and also getting to actually spend some quality time with my daughter. I bet the holidays fly by though. Anyway, as there are only two weeks until Christmas this means that there are only two weeks for me to fill this blog full of pretty seasonal photos. Therefore here are some pretty baubles. I love vintage decorations like this. And I love the way they had to be packaged up so carefully. They look so special. Great photo.